A house, she wanted to build, with every twig and stone the earth embraced, bonding with her mother, the earth. Not for a moment could she exclude herself from her imagination enthralled in a faraway land. Orchestrating these elements she creates a labyrinth of intersecting lines….ecstasy… her play. Living in the mystical times a poet, scholar followed the winds from Persia along with his followers to the majestic vale of Kashmir bringing along the best of the crafts to flourish in harmony with the inhabitants. Known as Shah Hamadani, a Sufi poet and a scholar introduced Islam along with elements of Islamic architecture and the art of Islamic geometry in wood through the crafts of Pinjrakari and Khatumbandh. 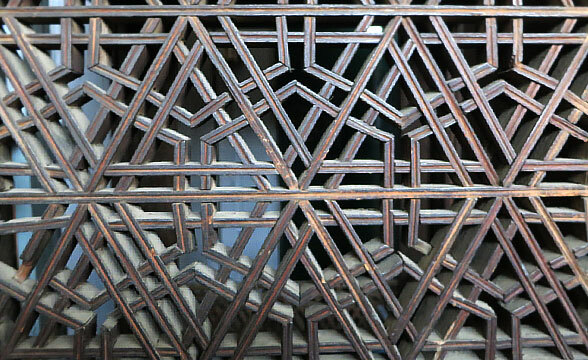 “Pinjra-Kari” is a craft of making screens of interwoven wooden laths forming intricate geometric patterns. Traditionally used in elements of architecture like windows, balconies, partitions and ventilators. 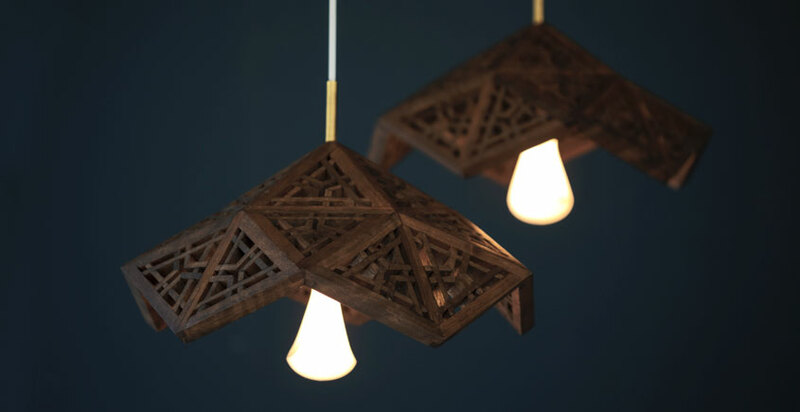 These lattice patterns are based on Islamic geometry, where the circle brings in the three basic or fundamental shapes or figures of Islamic geometry; the triangle, the square and the hexagon. The triangle symbolizes the human consciousness and harmony; the square represents physical expression or materiality and the hexagon the Heaven. These exquisite lattices bring into being a fascinating play of light all day long creating sublime moments between the dweller and the beholder. Adorning the windows and extended balconies called Zoondans or moon observatories, Pinjras had functional attributes rather than just decorative. Besides the valued privacy, they were very cleverly used to control the Sun in summers and cold drafts during the extreme winters. In winter they were covered with a layer of oiled paper to keep away the cold breeze and insulate the space inside creating a green house. The paper used for this was made locally and was know a Khosur Kagaz. In India the first paper industry was developed in Kashmir established by Sultan Zainul Abedin of Kashmir in 1417-67 AD. It also catered to the demand for large craft industry involved in Naqashi a fine art of miniature painting on paper and papier-mâché products. 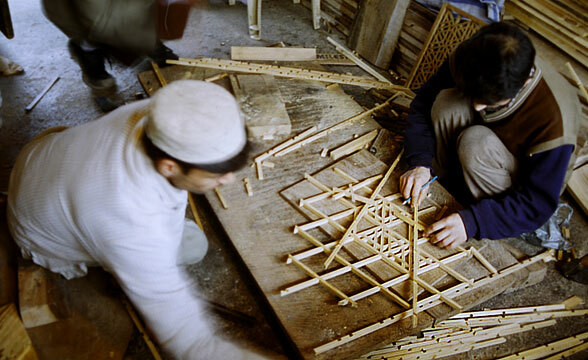 A Pinjra-Chan (Pinjra maker) needs a good understanding and knowledge of geometry and dexterity of using tools of wood and construction methods. The construction of Pinjra uses precision hand tools of fine quality; one can see the impressions of these fine tools in old Pinjrakari when looked closely. 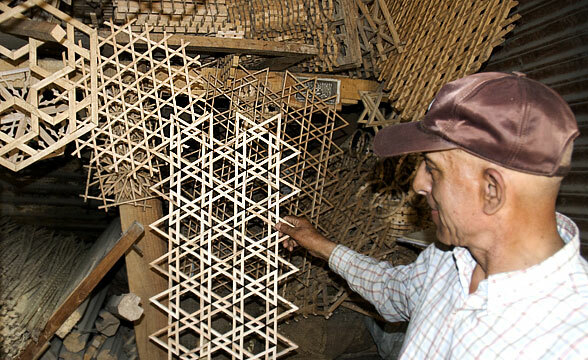 The construction of interlocking small pieces of wooden laths in a geometrical pattern results in a lattice. There are two types of joints, a halved lap with a bridle joint and a simple Tenon and Mortise joint. Halved lap and Bridle joint is formed by making grooves in the baton. 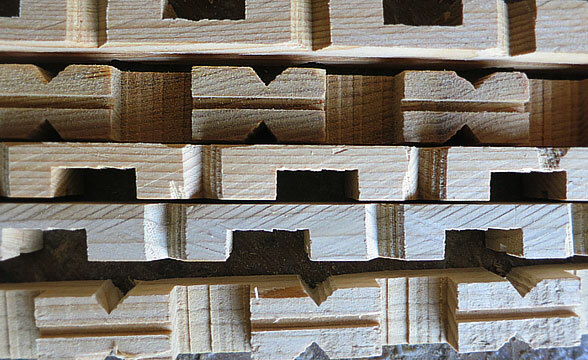 These grooves vary in shape and size depending on the thickness of the batten and the type of design. It could be a rhombus, rectangle or a cube. These grooves form by removing the material on one side of the batten at previously fixed intervals. The groove of one batten goes into the groove of another. Depending on the pattern, the grooves in a batten are on one side or on both sides. The geometry and the construction of these joints exert tensional pressure as in weaving and keep the laths in position without the use of glues or nails. 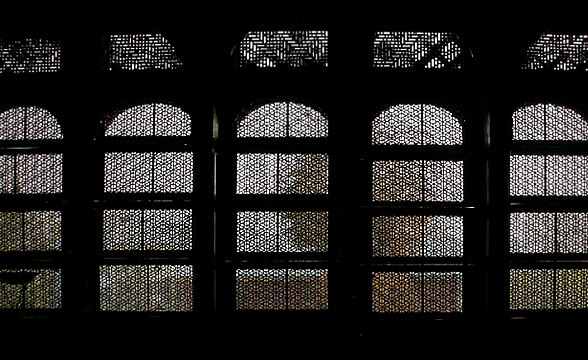 An outer frame that holds this delicate lattice also acts as the structural member for windows and other uses. Four kinds of trees supply wood for this art of Pinjrakari: Kaiur or yar (Deodar, Himalayan blue pine), Budloo or Sun-Gal (Himalayan silver fir)) and Doon Hut (Walnut). The Pinjra patterns are made from a selection of traditional designs. Craftsmen have developed a set of scales called Kannat for different patterns. The Kannat or measurements help ease of making, to cut the battens into different lengths and sizes. In this way, skilled artisans can make highly complex designs without resorting to mathematics every time and without necessarily understanding their underlying principles. The use of Kannat and the intrinsic nature of repeated components make the process mechanical. These Kannat’s are the formulas that were inherited from one generation to the other. A fine mud coating sometime was used for finishing of pinjra as a protective coating for a longer life. This coating also acts as a binding agent to put all the small pieces in place. 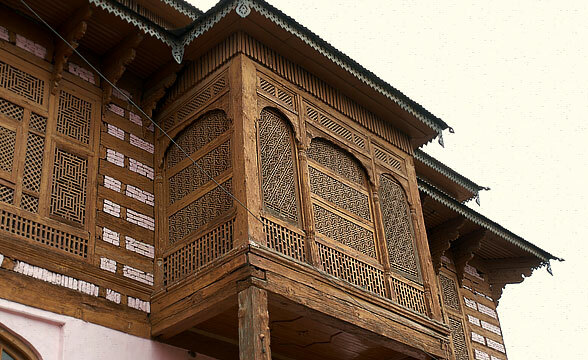 Kashmiri Pinjrakari is unique and differentiates itself from other forms of latticework seen in stone, metal or wood from across the world. Uniqueness of Pinjra found in Kashmir is in its fineness of scale of the batons. Sections used are as fine a 5 mm thick and 18 mm wide. Larger square sections of 20 X 20 mm are used for patterns that are very basic, like perpendicular batons crossing each other. Simple grooves running along the centre of the batons and minute notches along the width add to the visual intricacies. A simple “V” notch on a square opening creates an eight-pointed star profile. Prevalent in Islamic art is the star, a chosen motif for many Islamic decorations. In Islamic iconography the star is a regular geometric shape that symbolizes equal radiation in all directions from a central point. All regular stars — whether they have 6, 8, 10, 12, or 16 points, are created by a division of a circle into equal parts. The center of the star is center of the circle from which it came, and its points touch the circumference of the circle. The rays of a star reach out in all directions, making the star a fitting symbol for the spread of Islam. Over the time this craft languished, for its high value, time consuming and declining patrons. Later modern materials like glass, metal grills and readymade industrial mesh replaced traditional Pinjra. 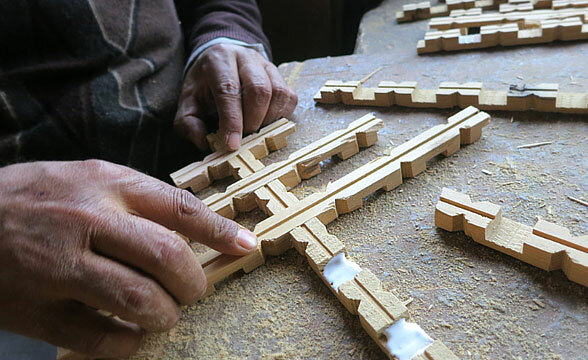 Some artisans and walnut wood carvers have picked up the art of making while repairing and restoring old Pinjra and also happen to cater to the local needs of the Pinjra. Pinjrakari today is not practiced and made the traditional way of interlocking batons. The use of glue or nails is prevalent now for its complexity. 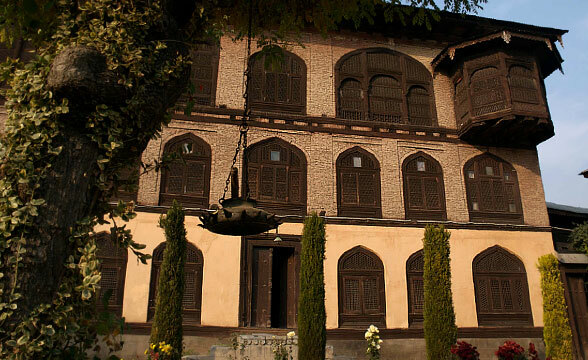 Origins of Pinjrakari as practiced by Shah Hamadani and his disciples dating back to 1373-1476 are seen in Tral a remote village east of Awantipora. 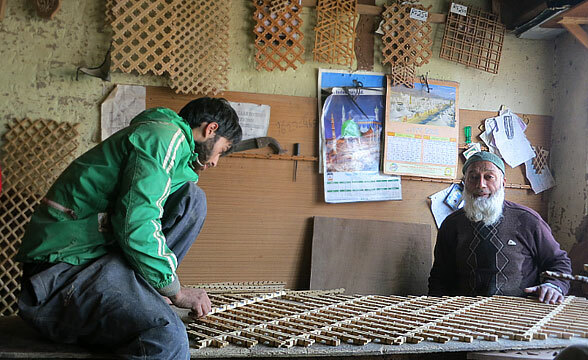 A Namda Gari Mohala and Zadibal area in Srinagar have traces of some of the fine Pinjrakari. Also to be seen are traces of dilapidated Pinjra on abandoned ruins of houses scattered across the valley. Note All products are made from natural materials and are handmade. There will be variation in Texture, & Color along with natural marks that are not consider imperfections in a product. Each individual piece will be unique in its color and texture like any natural material. Products are not meant for outdoor use. A house, she wanted to build, with every twig and stone the earth embraced, bonding with her mother,..